For a detailed map of the affected area of East Sprague, click here. Much of East Sprague Avenue in Spokane could be changed from a four-lane to a two-lane arterial under a plan intended to increase safety and enhance the urban environment there. The city of Spokane is using a $150,000 federal economic stimulus grant to develop the plan, which has support from residents and businesses in the East Central Neighborhood. “From our perspective, we are definitely favoring the plan,” said Landon Carrell, coordinator of the International District along East Sprague. The plan is considered a key component in drawing a mix of uses – residential, commercial and industrial – to the area. It seeks to maximize emerging investments in the portion of the University District south of the BNSF Railway line and a growing urban enclave east of the Hamilton Street overpass. 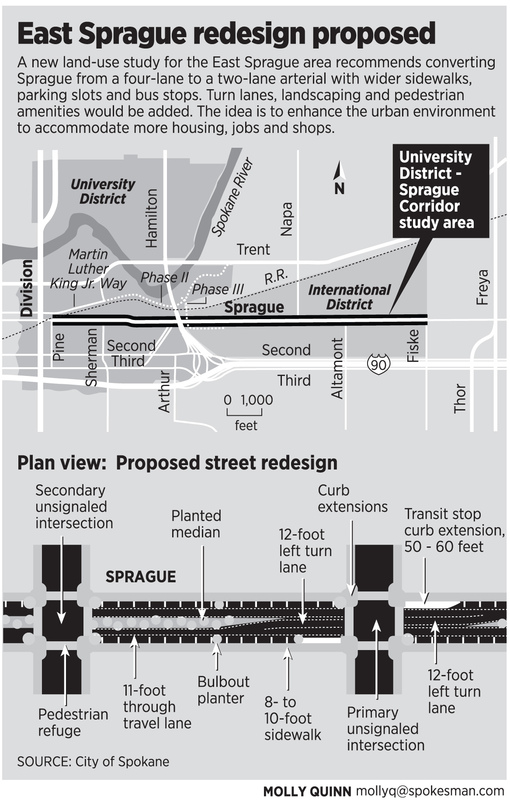 Rebuilding Sprague with median dividers, improved bus stops, better crosswalks, wider sidewalks, wider parking areas and landscaping could cost up to $20 million, according to the study. Business owners along East Sprague don’t want to wait until that kind of money is found – likely through state or federal grants years from now. They are asking the city of Spokane to spend $150,000 now to restripe Sprague under the proposed plan to see how well the concept works. Jack Strong, owner of Strong Solutions, purchased a 1907 bank building at 1718 E. Sprague three years ago in the heart of the International District. As president of the East Spokane Business Association, he said the realignment of the district’s main street is the key to making the area friendly for shopping, working and living. He said he invested in his Apple-authorized sales and service business on East Sprague because he sees the potential in the neighborhood. “I think it’s going to improve the flow of traffic, and I think it’s going to improve the safety for pedestrians,” he said. The planning grant was premised on the concept of encouraging walking, bicycling and transit and bringing more residents into the heart of the city. All of those reduce vehicle miles traveled and energy use – two fundamental goals in the stimulus grant, officials said. Strong said the City Council should consider rule changes for zoning and building to make it easier to redevelop and reuse older structures in the neighborhood. A four-lane segment west of Sherman Street would remain. The realignment is proposed for the segment between Sherman and Fiske streets. Currently, Sprague has no dedicated turn lanes. As a result, traffic often backs up behind vehicles waiting to make left turns, Strong said. In addition, the parking areas along the curbs are so narrow that larger vehicles frequently have side-view mirrors knocked off by passing traffic, he said. The plan also could limit left turns at every other intersection. Improvements would also make transit use more efficient and safer by building concrete “bulb-outs” for loading and unloading. For more information on the plan, go to eastsprague redevstudy.blogspot.com . Those projects could involve sidewalks, bicycle lanes, bus pull-outs, curb cuts, ramps and shared-use paths. A Web seminar on applications and grant criteria is set for 1 to 3 p.m. on April 10. To register online, go to www1.gotomeeting.com/ register/454934657 . Deadline for applications is June 30. For more information, go to http://www.wsdot.wa.gov/ bike /funding .